So.. R2 (1K), D1, D2, D3 and D4 are "SET" values to emulate the 12ax7 response right? There is no need to play with them? What do you mean by "Point of Clipping"? the negative grid bias voltage like -1.5v in a 12ax7? With what Resistor the Capacitor forms the RC filter? R?1 or R?2 or together? Do they effect only the frequency or the grid (gate) auto-bias point also? Can you please elaborate more about replacing a 12ax7 gain stage with an lnd150. * How to calculate the Cathode Resistor & Bypass Capacitor in the lnd150 gain stage to be equivalent to the 12ax7. 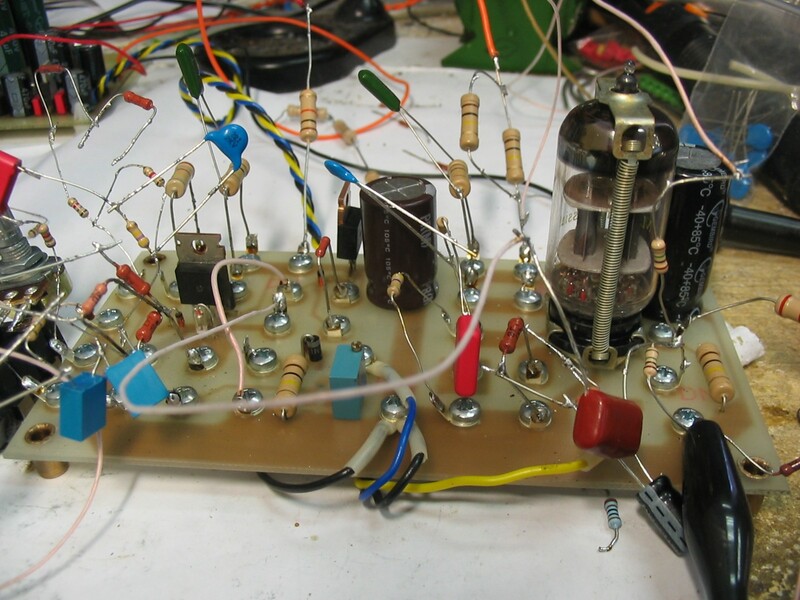 * How to actually bias the Gate of the lnd150 to be equal to the auto-biased grid of the 12ax7. * How important are the values of all the diodes in the circuit and what they actually for. * Why we need a Negative voltage at the Soure. Will be SUPER effective in terms of explaining the "How To"s.
Can we actually place 2 gain stages like these (with access to some pots) into a 12ax7 shape clear plastic enclosure and stick it in any 12ax7 place? I greatly appreciate the info here. к стати, Я так плохо читаю по руский что не надо даже пробовать. Some Translit.ru help here took me about 10 minutes. "Grid clipping point" (starting of "grid" current) defined by voltage drop on R3, forward voltage drop on D1 & fet cutoff voltage. It`s very hard to calculate it mathematically because there is no detailed description of diode VA curve at currents about tens of microamperes. Auto-bias point defined by negative source bias voltage & DC voltage drop on R?1, R3, D2-D4. Separete source biasing allows to independently adjust gain/frequency response & DC operating point of stage. I don`t see the way to calculate exact stage "on paper". You can try to use simulation programs to estimate values. I use testing board to adjust values for each kind of stage using signal generator, oscilloscope & RMAA for frequency response check. This is old photo witn 2SK216, now I replaced them by LND150. Only way to eliminate negative voltage at the source, is to use positive biasing of "grid" network. But it`s not suitable for input (from guitar) stage. Thank you. I greatly appreciate this. The sound clips sound great, excellent project!! How much current does the LND150 circuit draw? Without sitting down and working it out, I presume the valve pre would draw maybe 20-30mA max from the HT rails, how much does the SS version draw? I've got a couple of HT tiny torroids I could run in parallel, but they're only 25mA each. http://ampworks.co.uk/ <- Not much to see here yet!! Current consumption can be simply calculated from schematic using voltage drop on R30. (340V - 290V) / 10K = 5mA. Are the first clips the LND150 and the second clips are the tube or the other way around? I like the sound of the second clips, although the biggest reason is it sounds just a little more trebley and I like that. First time "N1" was recorded SS version (fet), second "N2" - tube version. I had a browse around your website. The FET poweramps with op tx sound great too. Do you think you could get similar results using vertical mosfets? The 2SK216s seem to be obsolete and from what I can tell there aren't that many lateral power mosfets around. Interesting, so I did prefer the tube version. From what I can tell though, it was primarily due to a treble boost in that circuit. Maybe something to consider for future circuits? I don`t find any replacement for them. Do you think you could get similar results using vertical mosfets? Vertical mosfets has several disadvantages - positive temperature coefficient (needs temperature compensation) & high transfer ratio. Yeah, that's what my research turned up. The only lateral mosfets I can track down the are the exicon models from profusion. If anyone has any other suggestions I'd be interested! So...are you going to start selling these things or are these just for your own use? Maybe I'll sell small amount of assembled boards as a kits (but not just now).